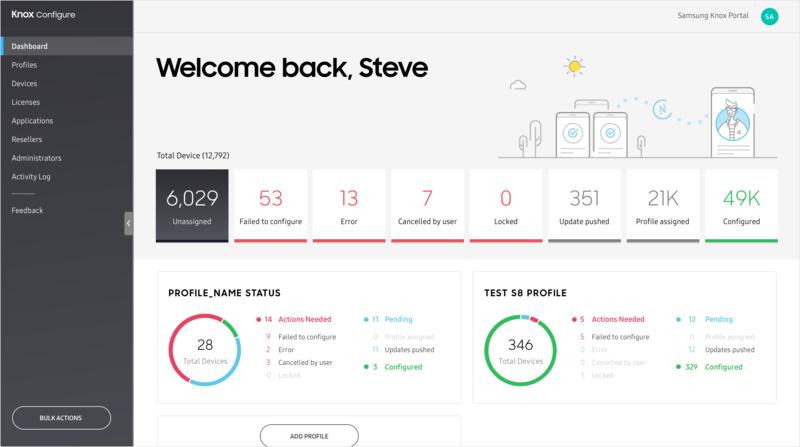 After spending the better part of the last year reviewing user analytics and engagement data, the Samsung Knox team is introducing new consoles of our industry-leading Knox Configure (KC) and Knox Mobile Enrollment (KME) solutions for IT admins, and the Knox Deployment Program (KDP) for participating resellers. The result provides optimal uniformity amongst our growing family of device enrollment and configuration solutions. Knox cloud service customers will find these versions highly engaging and easy to navigate, as user interface elements have been logically placed for quicker navigation. The new consoles are automatically personalized, with improved status updates from each user’s previous login. Colorized status indicators optimally display “at-a-glance” event severity to administrate events with best in class efficiency. These updated consoles are coming soon for both current and new Knox customers.